The Pew Charitable Trusts, in partnership with Navigant Research, recently released a study titled, Power Surge: How the Department of Defense Leverages Private Resources to Enhance Energy Security and Save Money on U.S. Military Bases. The study focuses on installation energy security, or the assured access to reliable energy sources to meet operational needs at the Department of Defense (DOD) bases in the U.S. and abroad. DOD has launched a number of initiatives to address energy challenges including energy conservation and renewable energy initiatives. 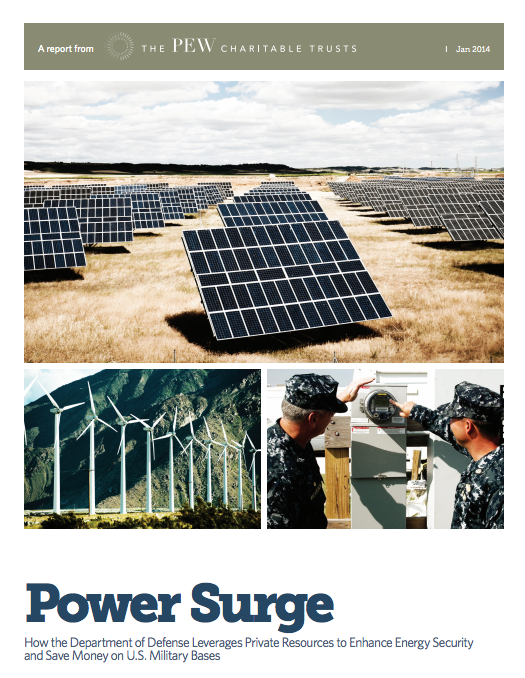 Pew has tracked these initiatives and in this latest report examines how the military is leveraging private-sector expertise and resources to deploy clean and efficient energy, thereby contributing to economic, environmental, and national security interests. Findings from the research highlight the importance of energy security as a Department priority, the effectiveness of policies like DOD’s Master Energy Performance Plan, the essential role third-party financing is playing in energy infrastructure enhancements, and the overall acceleration in clean energy efforts. Many other details and key lessons learned from the research are shared in the report. To view the full report, visit http://bit.ly/1in0ifq.